There were windmills in the yards and chicken and pigs running loose on the dirt roads of Kensington, MD, when a small mission that was to become Christ Episcopal Church held its first service there. The time was 4pm, Sunday, August 21, 1898. The place was the just south of the train station, in the Town Hall, which has since burned down. The local newspaper reported record-breaking heat and drought for that week. But just before the service, the skies poured forth a deluge. A sign from above? A congregation of 20 or so was led by the Rev. David Barr, the “Protestant Episcopal missionary for Kensington and Garrett Park.” Grace Church-Woodside of Silver Spring was the mother parish. With a few months, the women of the mission (“Please don’t call us ‘ladies,'” they begged.) added the money from ice cream socials and musical evenings to a generous gift from fellow Episcopalians Mr. and Mrs. George Peter for the purchase of a former Methodist Chapel at the southeast corner of Plyers Mill Road and St. Paul St. — now a private home. The initial service was held on Good Friday, 1899. The Rev. Barr stayed on as vicar until 1907, commuting from Washington for nine years, with little pay. In 1913, when Rev. George W. Atkinson was rector, the mission became an independent parish. Eleven years later, the church built a parish hall near Howard and Armory Streets, on land now occupied by a grocery store. The rectory was in the same block. For unknown reasons, the hall became the church and remained so for 26 years. In 1952 the Rev. Gerald Catlin, the rector, moved the flock into the vacated Holy Redeemer Roman Catholic Church at Connecticut Avenue and Prospect Street. They were barely settled before the county took over the land and removed the building in order to widen Connecticut Avenue. They now had a hall and rectory, but no church building. With Baby Boomers arriving by the dozens, and their parents (mostly World War II veterans) moving into the Kensington area, the time had come to build their own church. Under the Rev. Mr. Catlin, with tremendous help from a motivated parish, funds were raised and Christ Church Parish, Kensington moved into its own building on August 24, 1958. Even when the church was built, the need for education wing for the Sunday school was apparent, but it was not until 1998 under the Rev. Dr. William Hague that it was built. It was essential to the life of the church, since the rapid increase in new members and their children taxed the limited available space. With the generous support of the congregation and the leadership of the Rector, there was now adequate space for the Sunday school and other vital parish activities. 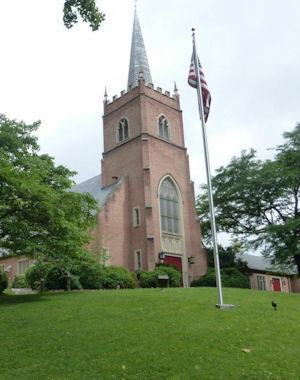 What started out as a mission with a congregation of 20 or so more than a century ago is now an active and vibrant parish, among the larger in the diocese. The worshipers of years past and those of today have all contributed to the making of Christ Church Parish Kensington. A more detailed history of Christ Church through 1998, with illustrations, is available in the parish library. 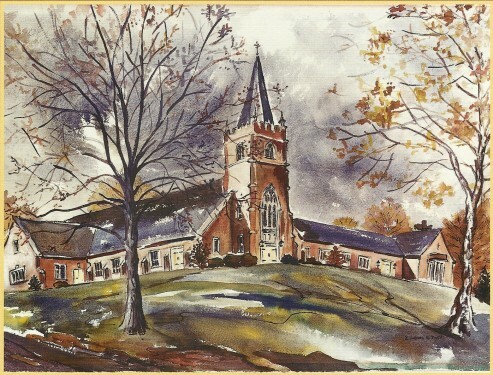 It is titled THE FIRST HUNDRED YEARS OF CHRIST CHURCH PARISH 1898-1998. Watercolor by Elizabeth Hayes Pratt.